This article is 3159 days old. A great airshow with monstrous B-52 bombers, blazing F-18s, and purring Harvards soared through Windsor last weekend, but a micro-scale airshow is about to take place starting this Saturday. 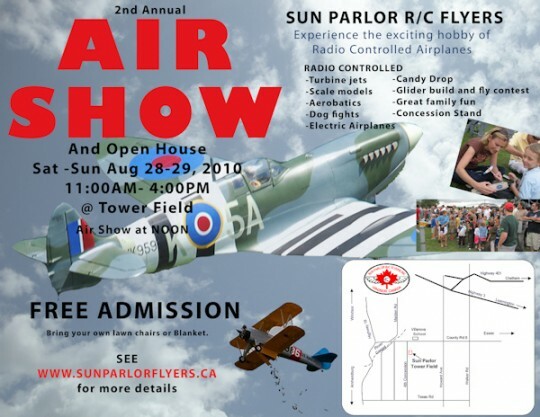 The Sun Parlor R/C Flyers Club is an organization for model aircraft enthusiasts, and each year they put on a Model Air Show just outside of Windsor. The club, with 80 members, has been in operation since the 1960’s, has their own facilities including a mini-runway and are inviting YOU to a free event this Saturday and Sunday. Pilots fly radio controlled propeller planes and jets of all shapes and sizes, they simulate combat, drop candy and even guide radio-controlled parachutes back down to earth. The event starts at 11am, but the model airshow itself runs between noon and 4pm on both Saturday and Sunday at the Sun Parlor Tower Field, 4819 Concession 4 N, Amherstburg, ON. Check this out on our Events Calendar for a Map and detailed directions.